Are you seeking to restore a terrazzo floor in your historic home or to maintain your commercial property? CENTURY STONE can help you. Our stone craftsmen are trained and equipped to restore terrazzo to its original beautiful appearance. Century Stone Sealing and Resurfacing can restore your terrazzo to its Mid Century Modern state with a hard, glass-like finish that is so easy to maintain. Terrazzo, popular in the 50s and 60s, is making a comeback. Terrazzo that is yellowed with layer upon layer of wax build-up or buried for who knows how many years under carpet, linoleum, or tile may not look like it can be restored. But it can be honed and polished so your terrazzo floors may reveal the brand new surface that lies beneath so your colorful little specks of marble glisten once again. Chip size – Marble chips are size graded to match the original chips. Chip distribution – Mix of chips is analyzed and determined to insure the repair blends. Chip type & color – Stone type and color is graded and matched. Matrix color – Color of the base cement, or, epoxy is analyzed and a comparable colored resin is formulated to minimize color difference. Once analyzed, a color-match portland cement or epoxy resin is custom prepared, and filled with the appropriate marble chips as defined by type, size and color. After setting, your repair is honed flat and polished to match the finish on your floor. Whether dulled by years of traffic, or, being brought back to light after languishing under carpet or tile, CENTURY STONE can assist you in bringing your beautiful piece of history back to life. Terrazzo treasures are discovered that had been hiding under many carpeted and tiled floors across the country. Many of these floor surfaces were covered up historically prior to the development the restoration techniques that CENTURY STONE uses today. Now, these time-capsules of art and beauty are being restored by CENTURY STONE across the country. 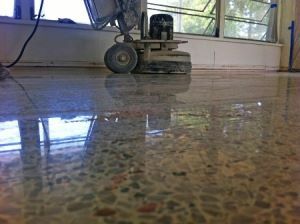 Add value and interest to your historic building or home with a restoration of your terrazzo floors.